Jewel-like clarity and pale straw hue (with a tinge of chartreuse). Sur lees quality, coconut, gardenia, jasmine, and apple. Apple, stonefruit, quince, loquat, dried toasted coconut shavings, and vanilla. Perfectly balanced with a sensuous mouthfeel that evenly coats the palate and provides a gratifying finish. Perfectly paired with BetterBeGrilled's Mango Fish Tacos, which will be nicely complimentary as both have fruity any creamy notes. We're proud to bring you today's wine, and we sincerely hope that you have the opportunity to take some home. Today's wine will sell out, so please be sure to make your purchase soon. 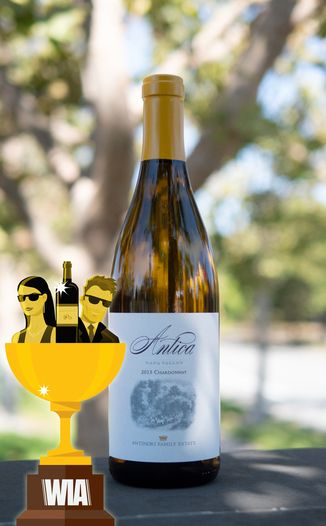 This beautifully crafted Antica Napa Valley 2015 Chardonnay, Atlas Peak, Napa Valley is one special wine. James Suckling, who awarded this wine a stellar 94 point score calls this wine "Fascinating". We call it a Chardonnay lover's delight! This Chardonnay is inviting with it’s jewel-like clarity and pale straw hue (with a tinge of chartreuse). The nose is fragrant and perfumed with sur lees quality, toasty coconut, floral aspects of gardenia and jasmine, with apple for the fruit component. Taking a sip, the apple becomes more pronounced and stonefruit such as quince and loquat join the mix. The oak provides dried, toasted coconut shavings and a nice vanilla twist. Neither lean nor flabby, this Chard is perfectly balanced with a sensuous mouthfeel that evenly coats the palate and provides a gratifying finish. For a guilty pleasure, go for a salad with diced chicken tenders, iceberg lettuce and a healthy serving of buttermilk dressing. The Antinori family has been making wine for an incredible 26 generations. their family name is equated through the world with superior quality and winemaking excellence, though those terms do little to underscore just how fantastic - and in demand - all Antinori wines are. The Antinori’s family’s winemaking history has been synonymous with the famed wine growing regions of Tuscany and Umbria since its inception more than six centuries ago, when Giovanni di Piero Antinori entered the “Arte Fiorentina,” the Winemakers’ Guild of Florence, in 1385. Today, the Antinori legacy is overseen by Piero Antinori and this three daughters, Albiera, Allegra, and Alessia. Together, they oversee one of the largest wine companies in Italy, and their innovations played a large part in the "Super-Tuscan" revolution of the 1970s. Antinori is a member of the Primum Familiae Vini. The company is the 10th oldest family-owned company in the world! We're sorry that we could not get more of this wine and we sincerely hope that you are able to partake of our offer. James Suckling - 94 Points "Oyster shell and cooked apple with hints of lemon follow through to a full body, tangy fruit and a flavorful finish. Minerally. Fascinating. Drink or hold." The elegance of the Antica Napa Valley Chardonnay is obvious in its crisp, orange blossom, fresh pear, mineral-laced, medium-bodied style. This wine has superb aromatic presence with impressive purity of fruit. This is a lovely, delicately oaked, flavorful Chardonnay.